Dakota Electric Association had a total of 5,084 people attend the company’s 21st annual Member Appreciation Event at the Minnesota Zoo on July 26. During the event, zoo admission was free to all Dakota Electric members and their families. 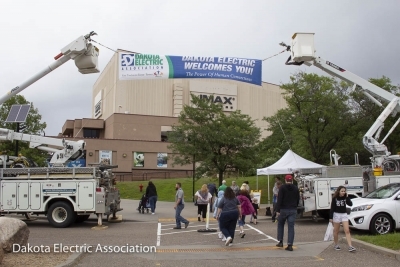 A banner held up by bucket trucks welcomed people to the MN Zoo for Dakota Electric’s Member Appreciation Event. As part of the event, Dakota Electric, a member-owned cooperative, asked attendees to bring food donations for area food shelves, and visitors donated 2,054 pounds of food along with $797 in cash. LED Lucy was on hand to greet the children. Since Dakota Electric began collecting food at the event, Dakota Electric’s members have donated nearly 17 tons of food and more than $11,000 for local food shelves. At the Member Appreciation Event at the zoo, cooperative members enjoyed Kangaroo Crossing, where they were able to walk through the display and see kangaroos, wallabies and emus. Members also had the opportunity to view the Hawaiian Monk Seals, African penguins, grizzly bears, gray wolves and more. Entertainment included the World of Birds Show, the Blue Ox Jazz Babies and close-up magic performed by Bob Miller. 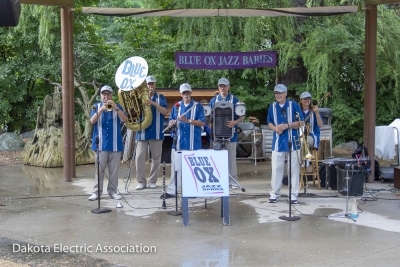 The Blue Ox Jazz Babies provided music near the outdoor plaza. 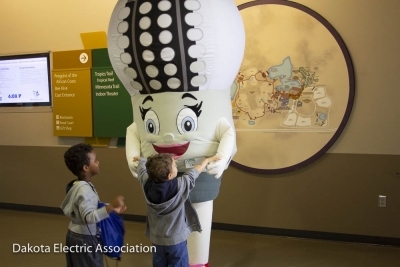 LED Lucy, Dakota Electric’s mascot, was on hand for added fun for the children, and many people enjoyed discounted tickets to the IMAX. Members can see photographs from the event on the company’s Facebook page (facebook.com/dakotaelectric).